This set of photos was taken on Saturday July 6, 2013 at 6:50 am. The location was in front of a great hotel in downtown Washington DC. The "Take It!" came as I stepped out of my car in front of the hotel on a Saturday morning at a time later than is my usual time for stopping at this scheduled location. The light of day was already getting a full start and thus the lighting was very different on everything. 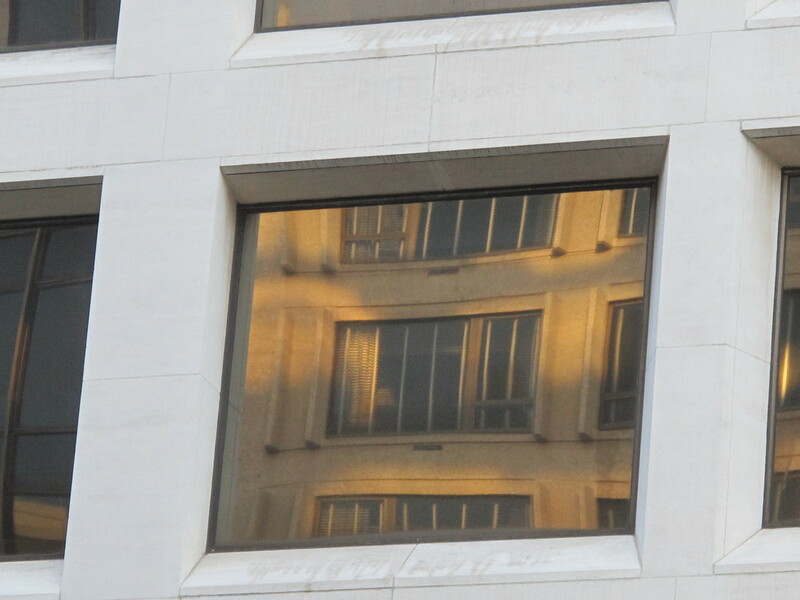 For some reason, I looked up while standing on the sidewalk in front of the hotel and saw this reflection of the hotel which was behind me. 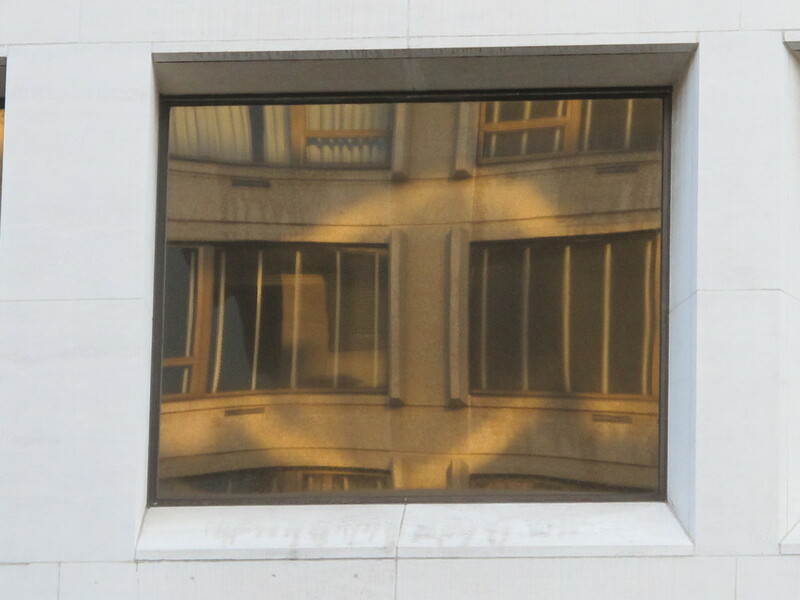 The building that was across the street was all white and had full square reflective windows as its facing. This reflective surface combined with the recessed windows made the perfect framing for the ornate look of the facing of the hotel. The extra reflections added just that much more impact to the image. I took two photos. The first gives more over all view of the setting. The second is a tighter framing of the same view. Two photos of the same thing that could not be more different. The After Take: To those that I showed these to and provided explanation - liked them very much. Part of the explanation included that I was running late - but was very glad, for had I been earlier - the image would not have been there. It seems that each day is a gift and if one wants to look at it, both closely and from a distance - the gift can keep on giving all day long. The end of the day provided a bright blue sky as it has been raining and the sky is clear. The sky was filled with puffy white clouds that had enough separation so that the game of "look for the figure" was difficult not to play. I enjoyed every moment of the long commute home with this as the magical cover. Wishing you great sights no matter what time of day it is. Please take time to both look for them - as well as to enjoy them. The window looks like a pool of water. Looks like a portal into another world! I just want to jump in. I'm with Jim, looks like water. The ring around it looks pretty cool. Seriously how do you find this stuff..... I look out my car window and just see city life. Been a couple weeks since I checked in. Always a pleasure. This shot is really trippy! Many thanks to all for your kind comments. I truly cannot understand how these views happen and I am lucky enough to catch some of them. I will refrain from questioning the luck - just be happy in passing it along.